Bound sets are held at Mennonite archives and historical libraries. A manuscript index to the paper is located at the [http://grebel.uwaterloo.ca/mao/ Mennonite Archives of Ontario] at Conrad Grebel University College, Waterloo, Ontario and the [http://www.mennonitechurch.ca/programs/archives/index.htm Mennonite Heritage Centre], Winnipeg, Manitoba. Friesen, T. E. “The Story of The Canadian Mennonite.” <em class="gameo_bibliography">Canadian Mennonite</em> (14 August 1959): 2. “High Aims and High Hopes.” <em class="gameo_bibliography">Canadian Mennonite</em> (16 October 1953). Hildebrand, Isbrandt. <em class="gameo_bibliography">Swath and Sheaf.</em> Winnipeg: Canadian Mennonite Publishing Association, 1970. “Introducing <em class="gameo_bibliography">The Canadian Mennonite</em>.” <em class="gameo_bibliography">Canadian Mennonite</em> (3 July 1953). 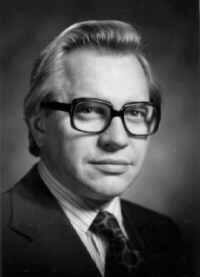 Kehler, Larry. “CM will cease publication.” <em class="gameo_bibliography">Canadian Mennonite</em> (13 November 1970). “New Venture of Faith.” <em class="gameo_bibliography">Canadian Mennonite</em> (5 October 1962): 1, 6. Ens, Adolf. "Canadian Mennonite, The (1953-1971) (Periodical)." Global Anabaptist Mennonite Encyclopedia Online. February 2005. Web. 25 Apr 2019. http://gameo.org/index.php?title=Canadian_Mennonite,_The_(1953-1971)_(Periodical)&oldid=104942. Ens, Adolf. (February 2005). Canadian Mennonite, The (1953-1971) (Periodical). Global Anabaptist Mennonite Encyclopedia Online. 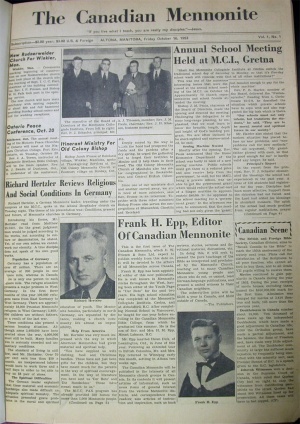 Retrieved 25 April 2019, from http://gameo.org/index.php?title=Canadian_Mennonite,_The_(1953-1971)_(Periodical)&oldid=104942.